So excited… we could pop! Of course our first passion is farm-fresh flowers. Justin works closely with growers in South America, California and Holland to bring in fresh cut flowers from beautiful loved farms directly to our Design Studio at 1640 West Fulton Street. But we realize that our customers love to take their beautiful fresh flower sentiment to the next level. In traditional retail flower shop fashion, we offer class mylar balloons and plush animals – but through the years we looked around our relationships in Chicago and partnered with amazing local businesses like Berco’s Popcorn. Here’s what we love about Berco’s Popcorn. The business started with passion. Matt loves sweets and made a career out of a passion – creating the best popcorn that every can enjoy. It reminded us of Grandpa Roy standing on the corner of Ashland and Addison Streets selling fresh cut flowers out of a truck and eventually turning into our flower world here at Ashland Addison Florist Company. 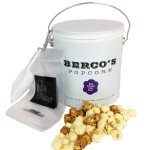 One of our most popular birthday gifts is our fresh cut flower design with a tin of Berco’s Popcorn. Our customers love how the tin of caramel and cheese mix comes with a cute scoop and share bags! It brings the personal gift to the next level of excitement by inviting other people to share in the celebration! We also had a blast compiling our fun any occasion Junk Food basket and including a bag of Berco’s Popcorn in it with tons of fun treats – another great share item to send your sister’s work or your college kid’s dorm room! Google Map Link- Click Here! And if you want Berco’s Mix delivered with a fresh flower gift, let us know!